Some say Vietnam has some of the best food in the world, and I'm not one to hear such a statement and not go and check out if it's true myself. 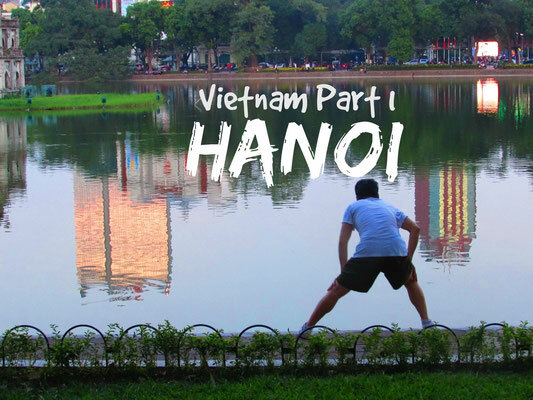 My 4 day trip with Travolor was a squeeze to fit in all the yummy food Vietnam has to offer, but lucky for me my friend Caitlin was there for 2 weeks and came up with this awesome list! To start the list off, I have to introduce the national dish of Vietnam – phó (it’s actually pronounced “fuh”). Found at practically every street corner, this simple dish consists of rice noodles in an aromatic clear broth, topped with meat of your choice (usually beef or chicken), and all the works: bean sprouts, basil, mint, spring onion, cilantro, fresh lime. The broth itself is packed with flavor, but you can always add more chili or fish sauce to your liking. Try this dish the local way, and start your morning with a bowl of phó! You’ve probably heard of this popular Vietnamese specialty – the bánh mì sandwich. While each region prepares theirs differently, the standard sandwich consists of a crispy French baguette stuffed with pork, pickled carrots and radish, fresh herbs, and most importantly, an unforgettable chilli sauce. 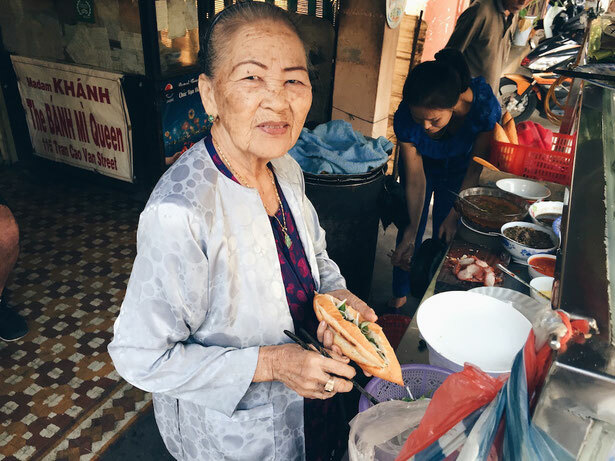 You’ll find bánh mì carts almost anywhere you go, but take my word when I say that you won’t find a better bánh mì than in Hoi An, known for their amazing fresh baguettes! 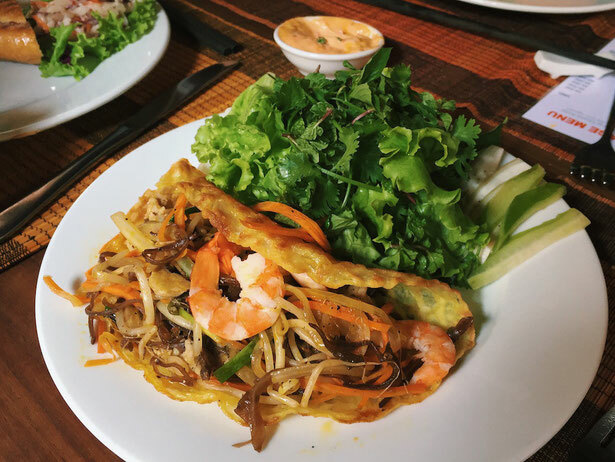 This dish is the Vietnamese version of a savory crepe-like pancake. A thin layer of batter, made of rice flour, coconut milk, and turmeric, is fried in a piping hot wok, and filled with pork, shrimp, and a handful of bean sprouts. Though there is no right way to eat bánh xèo, I prefer to wrap mine in fresh lettuce leaves, adding in fresh basil leaves and chili, and then dipping it in Vietnamese fish sauce before devouring it in one big bite. By far one of my favourite dishes, goi cuon is fresh, light, and the perfect summer food. The non-fried version of spring rolls, these rolls are wrapped in translucent rice paper and stuffed with fresh greens, vermicelli rice noodles, herbs, and either shrimp or pork… or both! Upon visiting Vietnam, I’ve realized that many restaurants serve this dish in a DIY-style, with everything chopped and separated on a plate. All you have to do is moisten the rice paper, fill in your favourite ingredients, roll it up and dunk in fish sauce before enjoying. 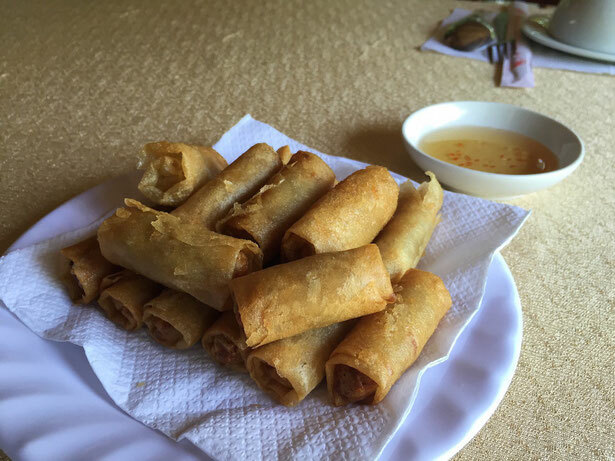 Different to the fresh spring rolls, cha giò are basically the deep fried spring rolls that we all know and love. They are most commonly stuffed with minced pork and diced vegetables, though some places use crab, tofu, or even mashed jicama or taro root. Never short of flavor or crunch, these rolls are great to order as appetisers; and don’t forget to dip them in that fish sauce! While walking down the streets of Vietnam, you’ll often see someone sitting by a steamer and, with the flick of their bamboo stick, skillfully create this crepe-like dish, known as bánh cuon. Literally translating to “rolled cakes,” bánh cuon is one of the more popular steamed rice cake dishes. These Vietnamese crepes are made from rice flour batter, and stuffed with minced pork, wood ear mushroom, and onion. 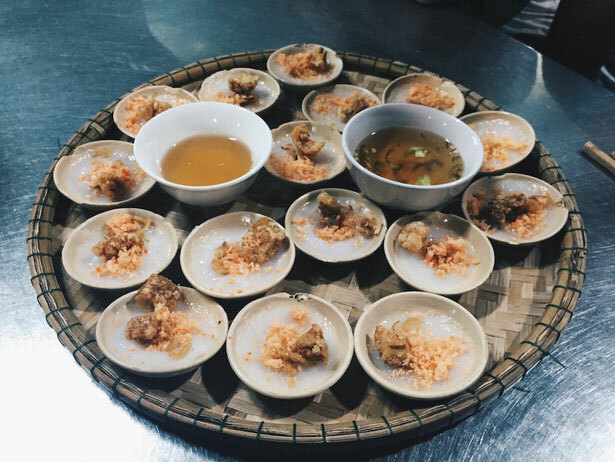 Finally, they’re topped with deep fried shallots and tiny dried shrimp, and drenched in everyone’s favourite sweet fish sauce. 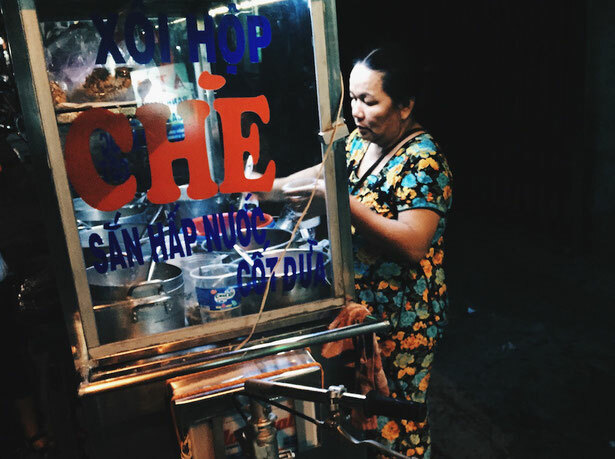 I’m not kidding when I say that I searched for chè stalls after dinner every night in Vietnam. Chè, pronounced like “chair,” refers to any Vietnamese sweet dessert soup that’s usually served with ice in a glass. With chè, the variations are limitless: pick and choose from the colourful bowls of fruits, beans, jellies, etc. It’s goopy, sticky sweetness, and it’s oh-so-good. So this next one technically isn’t a food, but it’s so incredibly delicious that I had to include it on this list- Cà phê sua đá, better known as simply Vietnamese coffee. The Vietnamese have taken everybody’s favourite caffeinated drink, added sweetened condensed milk, and changed the game. Seriously. I don’t know whether it’s the Vietnamese-grown dark roast coffee, or the drip filter that has me anxiously waiting on the edge of my seat, or the thick, creamy syrup, but after drinking cà phê sua đá religiously for two weeks, I don’t think I can ever go back to regular black coffee. Born and raised in Hong Kong, Caitlin is no stranger to the fast pace of city life. After studying for four years at boarding school in the states, she is back in Hong Kong. She's currently on her gap year, and taking the year to work and travel while meeting people along the way. 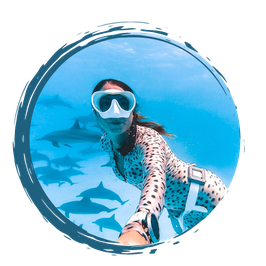 She's got a passion for animals, a love for food photography, and a desire to dance the night away- any time, anywhere. 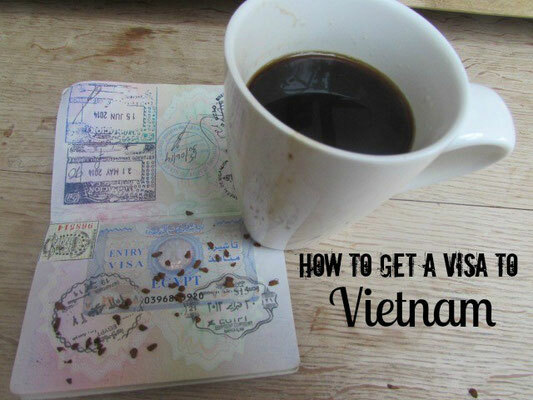 Want to take a trip to Vietnam? 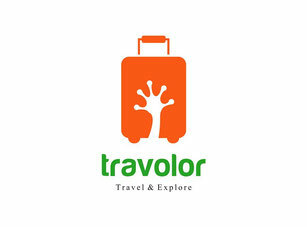 Contact Travolor for some great deals!